We have been hearing a number of rumors about the Samsung Galaxy S4 specs over the last few weeks, and now we have some more possible specifications on the Samsung Galaxy S4. According to Sammobile the Samsung Galaxy S4 specs include a 4.99 inch Full HD SoLux display with a resolution of 1920 x 1080 pixels, we had previously heard that the Galaxy S4 would use Samsung’s new 8 core Exynos Octa 5 processor by now it would appear that the handset will come with a Qualcomm Snapdragon 600 processor with a clock speed of 1.9GHz. It is not clear if this processor will be used in both the US version and the International version of the Samsung Galaxy S4 or whether each version will use different processors like the Samsung Galaxy S3 does. 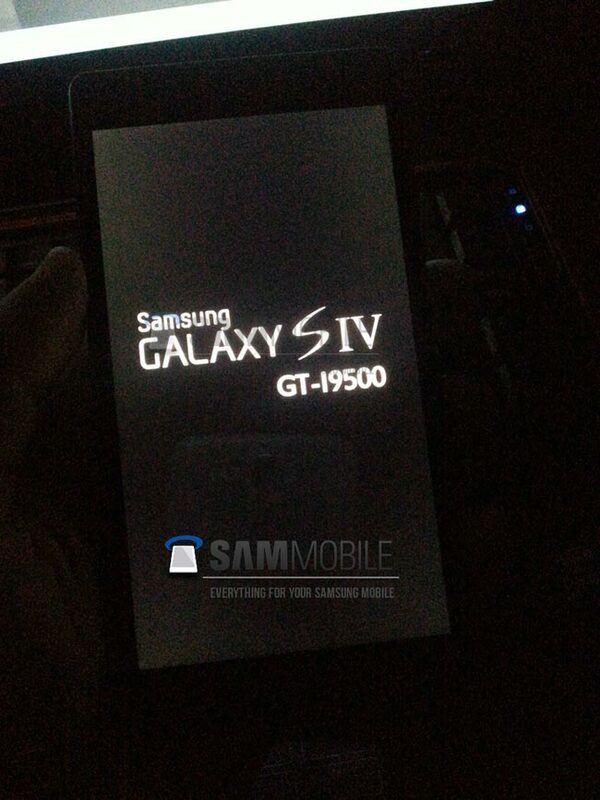 The Samsung Galaxy S4 is also rumored to feature 2GB of RAM and a choice of 16GB, 32GB or 64GB of built in storage, plus a microSD card slot, it will also come with 2GB of RAM and a 13 megapixel camera. 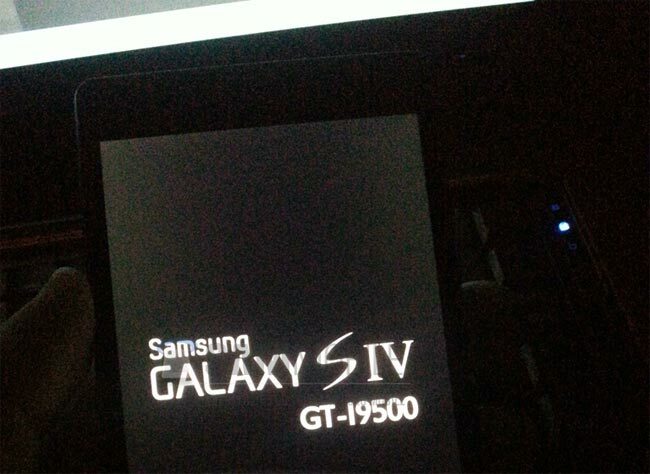 The photo above is apparently of the new Samsung Galaxy S4 booting up, and the handset is said to feature a home button with touch buttons, the casing is apparently made with a plastic back and aluminium sides and it will also feature a removable battery and will be available in both black and white versions. The leaked Samsung Galaxy S4 specs sound impressive, but what may set the Samsung Galaxy S4 apart from the competition is the rumored new features that Samsung are expected to launch with the S4. One new feature that we are expecting on the Samsung Galaxy S4 is touchless gestures, for example when you have an incoming call you would be able to lift the S4 to your ear and the call would automatically be answered, instead of having to press a button on screen to accept the call and let lift the handset to your ear. Other new features rumored for the Samsung Galaxy S4 are eye tracking technology, as two new Samsung patents for mobile devices were revealed, the patents were submitted under the Eye Scroll and Eye Pause technology. We can speculate how these features may work, for example Eye Pause could be used to pause a video you are watching on your Samsung Galaxy S4 when you move your eyes away from the display. Another new feature we are expecting to launch with the Samsung Galaxy S4 is called Samsung Orb, a new Photo Sphere like feature for the handset, although not many details are know about it as yet. The Samsung Galaxy S4 will apparently come with Android 4.2 Jelly Bean, and Samsung are holding a Samsung Unpacked event on the 14th of March in New York where they will unveil the new S4. We previously heard from one of our sources that the Samsung Galaxy S4 would go on sale in April, some time between the 15th and 22nd of April, and we are expecting the device to launch in the US and Europe at the same time.